Rhea. From early on their relationship didn’t run smoothly. Initially she refused his attempts until wily Zeus thought to transform himself into a cuckoo. When she held the shivering, miserable-looking bird to her breast he took his true form & ravished her. In her shame she had no choice but to marry him. Hera was venerated as a mighty goddess by her own right in the ancient world. She was respected as a patroness of women & protector of marriage. She was honoured every four years at Olympia, where there was a festival held in her name. However, it is inevitable that she be defined by her relationship to Zeus. Tales of his extramatiral exploits are numerous, to say the least. Perhaps she can be forgiven for striking back from time to time. Once Zeus fell for the charms of the Lybian queen Lamia. One version of myth says how Hera killed Lamia’s children & grief turned her into a monster. She was cursed with the inability to close her eyes so that she would not be able to escape the image of her dead babes. Zeus softened the blow by allowing her to be able to take her eyes out to rest. Lamia grew envious of other mothers & ate their children. Hera almost caught Zeus out once. Zeus turned the hapless Io into a white heifer. However, she wasn’t completely fooled & demanded that Zeus give her the creature as a gift. Hera left Io to the care of many-eyed Argus to keep her separated from Zeus. The king of the gods ordered Hermes to kill Argus. 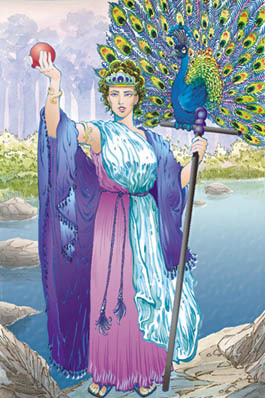 When Hera learned of this she placed all his eyes into the plumage of the peacock. Ever notice the eye-like pattern in its tail? Hera’s parenting skills aren’t fantastic. Her marriage to Zeus yielded a small few minor goddesses, including Hebe goddess of youth, as well as war-god Ares. Homer’s account states that she is also the mother of the lame smithy-god Hephaetus. Hera became jealous of how Zeus produced Athena without her, so she managed to give birth to a child on her own. However she was so offended by the baby’s physical imperfections that she threw him from the heights of My Olympus. Hephaestus later got revenge on his mum for her rejection by crafting a throne for her which would not let her get up after she sat on it. The other Olympians begged him to free her but he refused until Dionysus got him drunk. Hephaestus was taken back to Olympus thrown over a mule. He eventually released Hera after being bribed with the offer of Aphrodite for his wife. Hera often comes across as the archetypal wicked stepmother. Consider her treatment of the hero Herakles, Alcemene’s son with Zeus. To be fair it would be hard for any woman to cope with knowing her husband spawned an offspring with another. Hera took her hurt & jealousy to extremes from the start. When Alcemene was pregnant with Heracles, Hera tried to prevent her giving birth by tying her rival’s legs into knots. The servant Galanthis tricked Hera by saying she’s already given birth. When Herakles was a newborn, Hera sent two serpents to kill him. The baby strangled both creatures & was found happily playing with their limp bodies. The image of a wife left at home alone & crying in in the dark whilst hubby has his fun is all too easy to see, be it god or mortal. No doubt Hera may have a ‘human’ side where she weeps or gives way to darker emotions like sorrow or fury. Many have difficulty looking past the image of an angry, shrieking shrew. There is more to her than this, however. She possesses a deep, abiding strength & more patience than she’s often given credit for. It must take a certain amount of intestinal fortitude to endure the scandals & constant emotional drama life with a philandering partner of this magnitude would put her through. Hers is an enduring love. She must truly feel deeply for Zeus if she has remained by his side no matter what their life together has thrown at her. self-respect. It is no less loving to speak out with all the dignity of a queen if a situation or behaviour in another becomes unbearable. Sure, she is the queen of heaven & mother of all. There’s no disputing that in many ways Hera is the ultimate wife. However, remember that she renews her virginity yearly by bathing in the sacred spring of Canathus at Argos. Family life doesn’t mean one must give up his or her identity. Certainly marriage doesn’t, & shouldn’t, require either partner to become a creature bent perfectly to suit the other’s will. In renewing herself on a regular basis she constantly reclaims the part of herself she holds most dear. Whilst her methods might lack in tact at times, Hera lives by her own terms. For better or worse, she is herself.